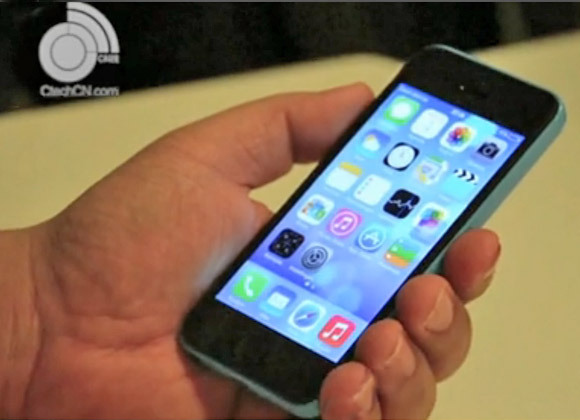 CTech already published a specs sheet for the iPhone 5S, but it seems the site has also gotten hold of a 15 second video showing the cheaper iPhone 5C (recognized by its colored plastic sides) that shows the device being unlocked, a quick peek at the app launcher and then the browser. Not that iOS 7 is in any way new – you can read our review here. It is possible that Apple will put some exclusive features that are available only on the new generation of the iPhone. Anyway, here's some footage of an operational iPhone 5C (rather than just photos of the chassis or packaging that have flooded the Web). Apple's event is scheduled for tomorrow and will certainly bring the iPhone 5S. There's a very good probability that the 5C will appear and only an outside chance that the cheaper smartphone will be China-exclusive (for carriers like China Telecom and China Mobile) and appear at Apple's September 11 event. We'll be covering tomorrow's event when we'll get the definitive truth from Apple itself. Thanks to Arjan for bringing the video to our attention! Fingers Crossed for the cheap iPhone to be really cheap. probably chinese fake. yuck anyway. iPhone i use for basic phone only. (make a call & sms).